Body and Soul presents a unique and emotionally intelligent approach to building a sustainable boudoir photography business. The higher-level strategies within these pages will enable photographers to move beyond the task of simply making pretty pictures to greater goals, such as understanding the emotional journey of the boudoir process, building meaningful, long-term relationships with clients, and creating a referral engine to sustain your business. 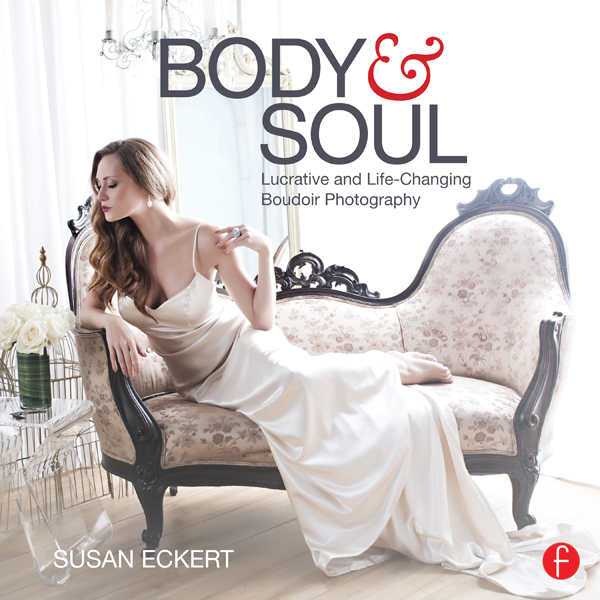 Susan Eckert combines her professional experience as an internationally published photographer with her advanced degree in Psychology to deconstruct the boudoir experience. Each chapter is complemented by interviews with her clients, and illustrates how photographers can partner with their clients throughout the boudoir process in the development of meaningful work. Susan Eckert is an internationally published photographer, a career-long member of PPA, and a member of WPPI and AIBP. Prior to becoming a boudoir photographer, Susan earned a master’s degree in Psychology from Columbia University.